If I ask who loves Rolls Royce people who haven't se en the car will also respond in the positive. The name itself has a lot of royalty that anyone hearing will have a word to speak. Rolls Royce has also been the symbol of royalty from so many years and it has become better ever since the new models have come to the fore. The latest Rolls Royce cars have been designed superbly and so carefully without affecting the survival of the original designs. This is my review of the latest Rolls Royce Phantom. If you are a billionaire, or even a millionaire, you own a company; you are the CEO of a multi- billion firm, I think this car is best suited for you. Driving this car is a wonderful breeze of an experience but still I feel being driven in a Rolls Royce Phantom would be even greater. I feel all those tycoons who go for buying the Rolls Royce would love to be driven in than to be driving it themselves. What does you like is your personal choice. If you feel that you should be driven in a car. Then you will be more than happy to go and buy these great palace-on wheels, or if you think you yourselves need to drive then I think it is not a good preposition. Rolls Royce Phantom's greatest strength is its engine and the ride quality which you won't get in any other car in the world. You might know about Paras Gupta, the youngest owner of a Rolls Royce Ghost, who is the Director of the Mother's Pride a Pre-school chain which has outlets in Mumbai and major parts of North India. He speaks about his dream of getting to drive the best in the world at a young age. If you happen to be bitten by the sting of love of owning the greatest man made machine on the planet, you are clearly in the league of owning, the new Rolls Royce Phantom. Luxury cars are those man-made machines which give us the imagination and the power to think on our limits and fly to new heights. Each and every person would dream of owning at least one luxury car in his/her lifetime. So speaking about this wonderfully designed beast, the Rolls Royce Phantom it is the symbol of strength, luxury, power. This latest Phantom has to be a great car and Rolls Royce brings the best to the world embarking on their past glory. The car is extremely powerful, absolutely smooth to ride and the greatest of luxuries ever put in a car. I would love to enter into my job of reviewing this marvel created by Rolls Royce. Join me in entering into the endless world of Rolls Royce Phantom. The looks and the styling is something which keeps the Rolls Royce away from almost all the other cars in the world. The commanding presence which the car brings onto the road is something others can just dream of. The car has a lot of design resemblance from the old Rolls Royce cars, the reason being even though the design has been taken to another level, the company has not taken away the basic DNA of the craftsmanship. The presence of this mammoth car is so big that other cars may look so pathetic and diseased in front of this great Rolls Royce innovation. People may love or even hate the design. I don't think young people will love the idea of buying a Rolls Royce, leaving aside sport cars. But I suppose there would not be a single billionaire in the world who may not have at least one Rolls Royce in his Garage. The new Rolls Royce Phantom being the signature car of the company brings a very commanding and loving experience. The design of a Rolls Royce is different from any other car and is head turning. The iconic grill, the huge bumper, the signature "Spirit of Ecstasy" emblem, which goes inside once you lock the car, the huge tyres, the precisely crafted details and door panel and colour, the large size of the car, and the Rolls Royce "Rs "present in the middle of the tyre which always remains in the vertical position, the colour schemes and everything you would find on this pulsating design is magically made by hand. There are conveyer belts, everything is crafted by hand and hence gives this ecstasy of being the best in the world. You will not get this kind of royalty and luxury anywhere in the world. Now speaking about the design personally I feel this is unique and stands out. It is not like a normal sedan but truly great in its own right. You may or may not like the design architecture. Personally speaking I love this design and this would be one of those cars I would want in my garage. A true man-made marvel. The new design is too charming and keeping in mind a century old legacy, this car is the marque of Rolls Royce. 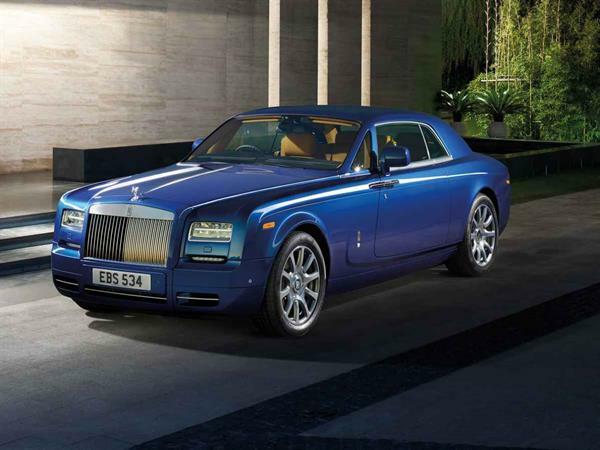 The specifications mentioned below are of the variant Rolls Royce Phantom Coupe Petrol. The car has a 6.8 litre 48V V/12 petrol engine with a whooping engine displacement of 6749cc having an amazing Horse Power of 453bhp@5350rpm and a maximum Torque of 720Nm@3500rpm. The 8 speed automatic gearbox is even smoother than the previous 6 speed auto. The car has a top speed of 250 kmph with nerve-wrecking acceleration figures of (0-100) in just less than 6 seconds, 5.8 to be precise. The ride quality you would have is probably the best in the world. The sheer power of the engine, the briskness and the agility it possesses even though it is a very heavy car, the state-of-the-art technology which it is equipped with is great and the best you will find anywhere in the world from any car maker. What Rolls Royce brings here and what surprises me is the agility and superb steering and maneuvering ability of this car. Being one of the longest and the heaviest and still providing and superb maneuvering ability is not easy but the Phantom excels here with outstanding greatness. For me hardest to digest feature which Rolls Royce Phantom has is the briskness and the hush and the quietness the engine has even in high revs. No matter what speed you are in the engine provides the smooth ride with quietness. The 8 speed auto too is seamlessly smooth, the driver inside will not feel even the slightest hitch or jerk, it is as smooth as it gets. The 8 speed auto is far more refined than the previous 6 speed auto. It does not ride; it glides over the road making it the best riding experience. With the amount of money you spend on buying these success statements, you are getting your money's worth. At first I never thought of writing about the mileage because there is no need, because people going for Rolls Royce won't think about mileage and fuel economy but being a review I think I should do it here. Imagine you are having a great machine with an engine displacement of almost 7000cc, how many kilometres or miles you would expect from it? This gigantic machine still delivers a good mileage of 4.8 kmpl in city and 9.8 kmpl on highways. An engine as massive as this still delivers good fuel economy, because going by the standard of the power of the engine I think the mileage is satisfactory or even better. Mileage wise speaking this car is on the better side considering the engine and how heavy the car is. Better suited for the rich, the interiors are one of the reasons why, those few people who go for buying one do it. The best technology you would find on any luxury car, and the materials used inside the car are top-notch. Because this car is truly handmade, there is nothing on this fantastic machine you would complain about. The cabin is aesthetically crafted to give you the royal feel. Superb infotainment system, with 8.8 inch screen, and great connectivity and communication features, you feel always connected to the world. The ambiance and the feel you get inside this machine is what you would get only inside a Rolls Royce. The wood used inside the car and the colour schemes makes this truly a craftsmanship marvel. Personally speaking I like the interiors because of its one of a kind design and the material used inside is truly of top quality. The rear is the most precious place to spend some time, the features, it provides gives you everything you need as an owner of The Rolls Royce Phantom. This interior designing and the quality is probably the best in the world no doubt at all. The car is priced exactly at 4 crores ex-showroom Delhi. I have nothing more to say about this. The price speaks it all. If you want to own a phantom, then you need to shell out this much money that's for sure. But for every single penny you spend, you are getting worth it, even more. Any person on this planet earth, wherever he may live, whatever race he may belong to, whatever religion he may be following at least once will have the dream of buying a Rolls Royce. Those who have this kind of love towards the car and also have the money will succeed and eventually bring this one home; they may be the luckiest ones. There is nothing you can complain about the pricing, if you want a Rolls Royce you need to pay the above said amount that's it. Iconic design, far too powerful engine, smooth and royal ride quality, probably the best crafted interiors, state-of-the art technology, brisk and agile, absolutely superb maneuvering and steering ability, smooth and fluent 8 speed automatic transmission. A more fuel efficient hybrid Phantom the need of the hour. You don't need speak anything if you have a Rolls Royce. The car will speak everything. The status, the royalty, the credibility and the greatness which comes by owning a Rolls Royce cannot be replicated by anything. The car is a symbol of status and power and those billionaires who can't live without that feeling, are going to buy this machine whatever may be the price. So was it the best car in the world and has it become better. I think there is a strong case of saying yes. Hope this articles helps. Drive Safe. God Bless.